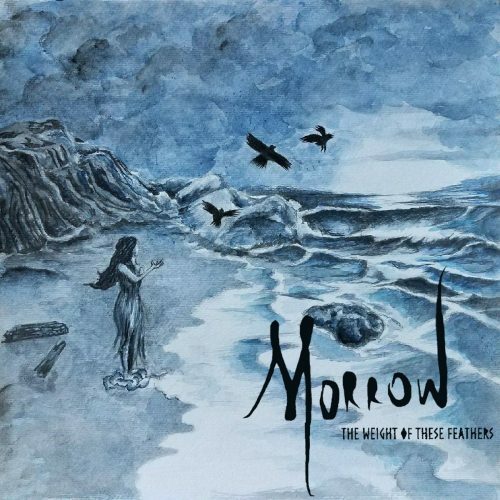 The Seattle band Morrow devoted four years of work to their debut album, The Weight of These Feathers, and it sounds like they devoted every waking hour of those four years to this remarkably impressive creation. It’s nothing if not ambitious, revealing a rich array of sounds, movements, and moods across these seven, mostly longer-than-average tracks, which collectively span almost an hour of music, and interweaving a diverse range of styles that includes (but isn’t limited to) black metal, progressive metal, ambient music, and folk. The album is marked by a constant ebb and flow of intensity, volume, and instrumental texture — a flow that never really breaks, as each track moves smoothly right into the next. The album’s boundless dynamism is one of its hallmarks. By turns, it’s storming and soft, eviscerating and ethereal, the shifts in sound dramatic yet seamless, proving to be immersive rather than jarring. And if you’ll forgive me for being wordy, I’ll add that the music is intimate and introspective, soulful and searing, romantic and flesh-wrecking, lush and lashing, meditative and mauling, dreamlike and devastating. Across the album’s changing patterns, a common thread of darkness runs through the melodies, but here too there are variations in the shadings, ranging from moods of wistfulness and longing to crescendos of shattering pain, interspersed with moments of genuine, lilting brightness and soaring splendor. Another common thread is that the music is intensely emotional — it shamelessly wears its heart on its sleeve and bares its soul. To realize these changing moods, the band have interwoven a host of instrumental sounds and rhythms. In addition to scathing and hammering riffs and battering drumwork, you’ll encounter soft, folk-like acoustic picking and strumming, gleaming tremolo runs, beautiful cascades of ambient melody, intricate flights of progressive guitar performance (some of which hints at a jazz fusion influence), and some truly stellar soloing. One further stand-out aspect of the lush instrumental arrangements is the use of a cello (and of a string quartet in the prelude to “Allure”), which figures prominently in several tracks, adding its soulful and sorrowing voice in ways that enrich and deepen the emotional impact of the music, and create some of the album’s most beautiful moments (among many). The music does include vocals, though they are used judiciously, more as accents to enhance particular moods rather than as an ever-present or dominant ingredient. Apart from a brief choral harmony at the end of “Elysium I” and a spoken-word reflection at the end of “Elysium II”, they’re mainly cauterizing shrieks and harsh roars, which amplify the pain and anguish in the most intense of the instrumental passages. When reviewing one band’s music I generally avoid dropping the names of other bands as references, because I’m always afraid that what I hear won’t be what anyone else hears, and I might be making a mistake in doing that here. But as a further sign of the extent to which Morrow have pulled from different stylistic sources, I was reminded at different times in listening to the album of early Deafheaven, Panopticon, The Mahavishnu Orchestra, Al Di Meola — and most especially Cormorant. And maybe that will prove at least a rudimentary guide, but you really should just listen for yourselves. It’s easy to get immersed in what Morrow are doing and to be carried right along through this ever-changing trip.